Flood damage is hands down one of the worst things to happen to a vehicle. It’s unfortunate that there are still plenty of flood-damaged cars in the second-hand market today. If recent experience is any indication, heavy rains and floods are as much a part of British winter as hot tea or Santa Claus. Floods cause damage to property, and that includes the family vehicle. You’ve most likely seen pictures of cars nearly submerged in flood water on the internet, rendering them virtually useless. These water-soaked vehicles are extremely dangerous to drive, if they even run at all, and have absolutely no business being in the second-hand vehicle market. The AA had previously warned buyers of the dangers posed by flood-damaged vehicles, citing that catalytic converters and exhaust systems can be seriously damaged, and that wheel bearings could be completely locked up. In addition, the brakes, alternator, and the starter motors could fail. Water damage can also lead to serious electrical and electronic problems, such as airbags going off unexpectedly, or not deploying when you need them to. Below are some of the measures you can take in order to avoid buying a flood-damaged second-hand car. Watch out for dank smells. Drying out a flooded car properly is close to impossible, so be sure to sniff for any damp or musty odors. If you come across a used car being sold with its windows open, be extra cautious as the seller might be trying to conceal the tell-tale smell of flood damage. Feel for damp spots. Water usually accumulates in areas such as the footwells, the boot, and the spare wheel well, so it’s a good idea to check any carpets in these areas for signs of dampness. It is possible for carpets placed in these areas to still be a little wet weeks, even months after the car was flooded. Also, look for interior tide marks that appear if the car was in water for a long time. Look for signs of rust. If the car appears to have more rust than it should have for its age, it could be an indication of flood damage. Check under the bonnet and on the underside of the car as these are the places that are most likely to have been under water if the car was indeed flooded. Water can also wash debris and silt into the vehicle, so look for mud or sand in unusual places. Check the electrical system. Water and electricity make for a horrible combination, which is why flooded vehicles are likely to have issues with their electrical systems. Make sure that all the lights and the audio system are working, and that there are no warning lights flashing on the instrument panel. There should also be no water trapped in the car’s lights. One or two electrical components failing isn’t an indication that the car is damaged, but it should serve as a red flag. Check the oil. 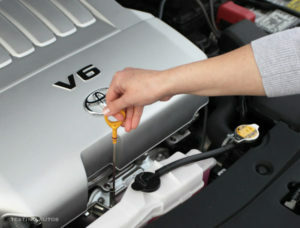 The AA recommends looking at the oil built up under the filler cap when checking for possible flood damage. If you see a white deposit there that sort of looks like mayonnaise, it is possible that there was water in the engine, which is bad. Ask the seller. If the car is being sold from flood-stricken areas, be sure to talk to the seller about the vehicle’s history. Even if his story checks out, inspect the vehicle or have an expert do it for you to make sure that it doesn’t exhibit any sign of flood damage.